Traitor, Lodger, German Spy, Tony Rowland. APS Publications, 2018. He landed via parachute in early November 1940, near Bletchley Park. He made his way to Cambridge where he managed to fly under the radar of the authorities for several months. In late March, 1941, likely after running out of funds, Ter Braak shot himself in a Cambridge air raid shelter. At least that's the official story. There are many unanswered questions about Ter Braak: did he manage to contact the German Abwehr using his wireless transmitter, what was his mission, were other spies dispatched to England to supply him with funds, was it really suicide, how could he have escaped MI5s watchful eyes? While non-fiction writers are left to piece together very flimsy fragments of fact... fiction writers can develop the story in strange, wonderful and intriguing directions. 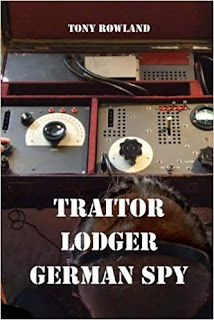 Such is the case with a new fiction book by Tony Rowland entitled Traitor, Lodger, German Spy. Tony takes the factual framework of the Ter Braak case and then runs with it. I've had the privilege of reading an early draft version of the manuscript and the story has only gotten better since then! You can check it out on Amazon.co.uk here... ebook is only £1.99!